I Skate, Therefore I Am: Die Posers Die! returns! Numbered & Signed By Tony Alva & Christian Hosoi. visit www.exhibitagallery.com for more info and updates! for pre showing on 02/24/11 – please call 323.954.7295 begin_of_the_skype_highlighting 323.954.7295 end_of_the_skype_highlighting to schedule an appointment. Check out the event video for "Die Posers Die: The Non Conformist" at their Youtube Channel: ExhibitAGallery. 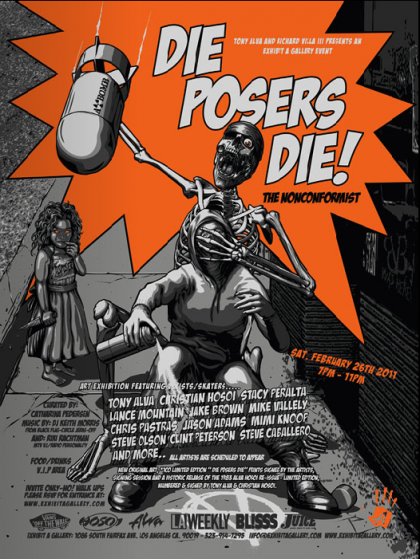 Here is the direct link to the 2nd Annual Die Posers Die Event, http://www.youtube.com/watch?v=eR9xespCh0c.